The Pankisi Gorge cuts down from the Caucasus Mountains near the Chechen border to the high plains in the northeastern corner of the Republic of Georgia. Shepherds tend their animals on the hillsides. Orchards and tilled fields dot the valley. 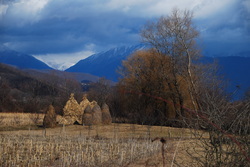 Pankisi borders Chechnya and is home to about 10,000 Kists (pronounced "Keests", they are descendants of Chechans and Ingush). 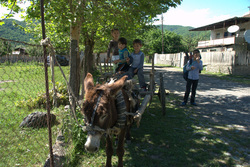 The large influx of Chechen refugees after 2003 has gradually subsided; less than 1000 refugees remain. The highland Islam of most Kists draws on Sufism with elements of Christianity and traditional beliefs, though a devotion to "pure Islam" is growing among some Chechen refugees and younger Kists. Older minarets like this one are often more decorative than newer ones. 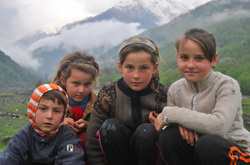 The children of the Pankisi Gorge have wishes and dreams that are difficult to fulfill. They help their families get by and hope for a better future. "Amid the spectacular natural beauty of the Pankisi Gorge; among all the quick smiles and sudden humor and endless generosity of spirit; in spite of the incredible bounty of the autumn harvest; nestled next to the dreams of children; lying just beneath the surface of a warm hello; carried on the winds between the notes of a haunting polyphonic melody; momentarily illuminated by a thunderstorm’s lightning flash; rarely talked about but omnipresent, lies the stark reality of relentless poverty, crushing hardship, stinging prejudice, and the yearning for a better life. It blankets 2 little boys, who live in a cowshed, offering no comfort or warmth. It makes fighting a jihad in Syria seem attractive to more than 100 of our young men, 4 of whom died there this summer. It makes our girls not question teenage marriage and motherhood, or dropping out of school. It crushes creativity and dreams of a better life by offering no means of realizing hopes for the future. It makes it difficult to see the value of education when there are no jobs. Or if one does have a job, and only 10% here do, it pays next to nothing. It fosters hopelessness, often misidentified as boredom and laziness. It breeds illness and disease that are preventable but remain untreated. It is so big." The people of the Pankisi Gorge are about 75% Kist. The higher into the valley, the more Kist. Family traditions are important and extended family bonds are strong. Unemployment runs at about 90%. People share what they have and make do as best they can. 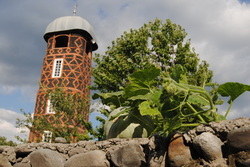 Pankisi.org is a site maintained by the Polish Tourism Bureau. It has maps, bits of history, and extensive photo galleries, as well as agrotourism opportunities. The Wikipedia entry on the Kist people is spare, but not quite so sketchy and partial as the entry on Pankisi Gorge. The entry on Georgia is extensive, but does not mention Pankisi specifically. A helpful and delightful article on Pankisi cuisine that includes a good overview of Georgian history is “Georgia: A Culinary Crossroads” by Darra Goldstein. You can download the article, written for the Silk Road Journal, here. A wonderful article on Sufism in Pankisi Gorge (particularly as practiced by women) and the changing face of Islam there is "The female Sufi mystics of the Pankisi Gorge" by Tara Isabella Burton. Several recent scholarly articles have looked at the changing face of Islam in the Pankisi Gorge. The most accessible is probably George Sanikidze. "Islamic Resurgence in the Modern Caucasian Region: "Global" and "Local" Islam in the Pankisi Gorge" [PDF]. The best may be Rebecca Gould's "Secularism and Belief in Georgia’s Pankisi Gorge" (download PDF at site).